If you are unemployed in the state of Pennsylvania then the PA Unemployment Commission (UC) will help you monetarily with your day-to-day activities. Once you qualify, this will help take care of the bills and ensure that you can fall back on a few benefits during this transition phase. 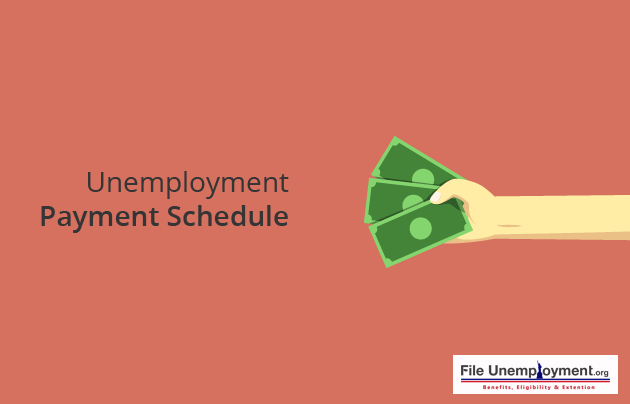 Hence, it is important to file for unemployment as you can as look to derive a certain monetary creche that will give you the time to look out for work in that time span. So why worry, when the Pennsylvania UC will give you the right support needed to get you back on your feet! Online: Fill this online application at your convenience. Telephone: Call the toll-free unemployment compensation number at 1-888-313-7284 or 1-888-334-4046. Paper Form: Use this paper application to file unemployment and mail or fax it to a UC service center. As a worker, you are entitled to certain claims partially if you are working partially to cover some of your overheads. You are still entitled to UC benefits based on furnishing the above details and the following these eligibility criteria. Separated but you continue to work as a part-time employee for another firm/s. You can make additional claims if you are not employed at the end of the year, meet the base-year eligibility requirements and earned close to six times the weekly benefit rate of your first application. Before making these claims, you must ensure that your employment, either full, part-time or temporary is covered by UC Law. You can also establish a claim against the state that after maximum entitlement to Pennsylvania UC benefits are exhausted. Once all the details are ironed out, you will receive your first benefit payment within four weeks of your application. Once you are eligible for benefits, you can file biweekly claims and receive your first benefit payment within four weeks from the time that you filed your application. Since the time you filed your application, your first payment would be only for one week after the waiting week. Usually, benefits are paid biweekly and within four days after the biweekly claim is filed. At times, this can take up to 10 days before you receive your payment. Payments may be delayed if the eligibility issue is not resolved. Your benefits can be paid through your debit card or by a direct deposit. Just remember that you can also file your current application and still receive your previous UC benefits. When required, you can switch from a direct deposit to a debit card based on your preferred method of payment. Since it may take a while for direct deposit options, you can avail financial assistance through your debit card. There are two methods of getting information about your benefits. Your recent payment information can be accessed on the Benefit Payment Information page or by calling 888-255-4728. Additionally, your payment history can be sort by visiting the Benefit Payment Information page or calling the UC service center at 717-525-5160. By calling this number, you can receive two free faxes of your UC details after which they would be chargeable to your account. It’s only a matter of time before you receive your benefit in your respective account. You can log in with your PIN and access your benefit payment information here. In doing so, you must enter your Social Security Number and UC Pin that is provided to you on the Claim Confirmation Letter. The minute your credential is received you will be taken to the Benefit Payment Information screen where you can review your recent payment history. Click on Additional Benefit Payment History and this will open to the Current Claim Summary where you can view the Total Benefits Payable, Remaining Balance and Currently Weekly Benefit Rate. 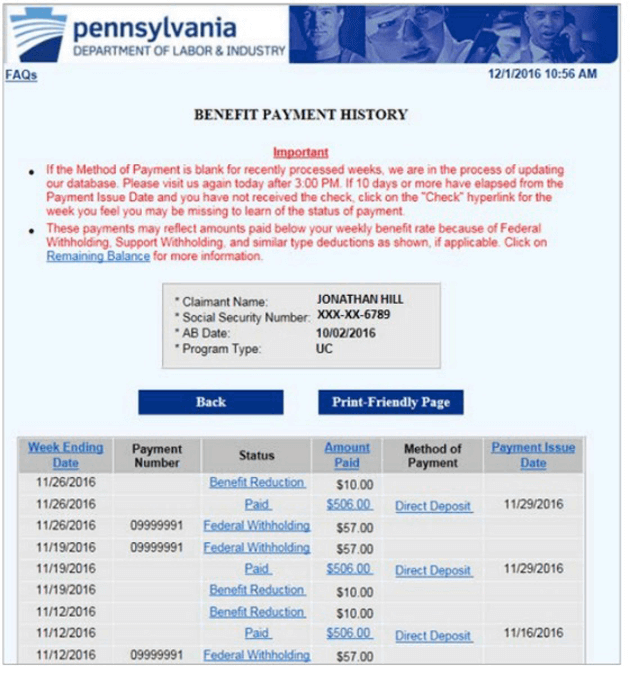 Select View Benefit Payment History. On this page, you can review the status of your payment, the date on which it is issued and whether it is sent via direct deposit or debit card deposit. Additionally, you can also view your tax withholding amounts. Simply enter your Social Security Number and your PIN and you can find these details. Additionally, you can review your payment history as described above to review all the transactions in your account. With respect to the PA UC Law, the application for benefits would be based on financial and benefit eligibility which will enable you to re-qualify for these benefits after filing the application. This will allow you to earn sufficient wages and help you remain financially eligible. Additionally, the nature of the job is considered and the reason behind why you have separated from your employer would be reviewed here. In order to ensure that you receive these payments, you should be eligible to find a job that would get you back on track. 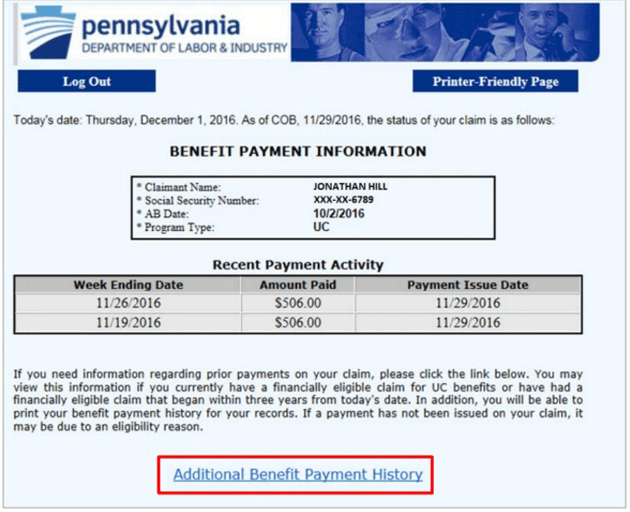 Since there are several unemployed that claim benefits from the PA UC, there are chances where you may receive a delay in payment. This can be resolved by reviewing your payment options based on the Direct Deposit, UC Debit Card and determining your Benefit Payment Information to review if you have received for entitlement. You can also review if you have received your payment from the Benefit Payment Information page and by checking your Payment History. If this fails to help you check if you have received your payment then you can check your claims and benefit status. You can also call 888-255-4728 to rectify payment details at the earliest from Monday to Friday between 6 a.m. to 9 p.m. and Sunday between 6 a.m. to 11 p.m.
Once you file your application for UC benefits, you will receive a Claims Confirmation letter. In this letter, you will be provided with a 4 digit PIN that is necessary to file your biweekly claim. Additionally, you will find the date that you will use to file your biweekly claim. For most, this is usually the second Sunday after you complete your initial application to receive your benefits. Just remember, you will have to file for two benefit weeks every time which begins on Saturday and finishes on Sunday. This is known as the compensable week ending date. Though you file for two weeks at a time, you are eligible for each passing week separately. So you must ensure that you file timely to ensure that you are paid on time. You can file your biweekly claim online anytime between 6 a.m. to 11 p.m. on Sunday, and 6 a.m. to 10 p.m. from Monday through Friday. Additionally, you can call the TTY at 888-255-4748 from 6 a.m. to 11 p.m. Sunday, and 6 a.m. to 9 p.m. Monday through Friday. A TTY is used specifically for those that are hard of hearing and speech impaired to allow them to communicate messages back and forth instead of having to communicate over the phone. Additionally, the videophone service allows individuals to use sign language to communicate every Wednesday from noon to 4 p.m. at 717-704-8474. Once your mail is received, you will receive a Claim Form. This form will help you claim benefits for the claim weeks. The face of the form will be title Claim Week Ending On. As stated, the claim week will begin on Sunday and end at midnight on Saturday. If this form is stolen or misplaced, you should contact the UC service center at the earliest. In this Claim Form, you should mention whether you have been employed during the weeks that you are issuing the claim, personal details like Name, Residential Address, Zip Code, Dates of duration of work, total work hours, hourly rate and gross pay. You must also mention the reasons for your separation from employment and if you had received vacation by your previous employer. If certain claims are to be left blank, then you should cross out these sections. In case you need to change your name, address and telephone number then you should re-print your details to avoid any errors to creep in. Ensure that you add the date and sign to certify that the form is complete. Enter your name and the return mailing address on the upper left corner of the envelope. Do mail your claim form as detailed in the Claimant Instructions in the form during the week beginning as printed on the form. If all the details are met as prescribed by the Claim Form then it will be processed for payment. An incorrectly filed form will be returned and this can lead to a delay in receiving your benefits. The Unemployment Compensation (UC) protects all from job loss by ensuring that they receive a temporary income support to those that are unemployed through no fault of their own. These benefits are payable to those that can actively seek new employment. You must qualify for UC benefits under Pennsylvania UC Law and previously employed by an employer that elected to contribute towards the UC Fund. Employer contributions are the main sources of UC benefit payments. You are applicable to pay federal employer taxes that are collected under FUTA. New Employer Rates – Businesses that pay wages for the first time are assigned as a new employer and the contribution rate of 3.5 per for new employers is applicable for Non-Construction and 9.7 for new employers of Construction firms. Standard Rates: Those employers that have a sporadic employment history are assigned to the Standard Contribution Rate. A standard rate will be assigned to employers with zero or positive reserve account balances and a higher standard rate is assigned to employers with a negative account balance. On the lower rate, employers would be charged 6% and the highest being over 11%. Computed Rate: Once an employer has provided covered employment and paid wages for two complete calendar years then the employer falls under the experienced-based rate. There are several variations in the contribution rates assigned to employers based on the assessment of unemployment risk of the employers. The Office of the UC Tax Services reviews the compensation history and the rate at each calendar year through June 30 of the earlier year. Hence, an employer with a high rate of unemployment will have a higher contribution rate and similarly, employers with stable and lower unemployment will receive a lower rate. The contribution rate is based on six components namely; Reserve Ratio Factor, Benefit Ratio Factor, State Adjustment Factor, Surcharge Adjustment, Additional Contributions Factor and Interest Factor. Delinquency Rate: Those employers that pay 3 percent higher than the rate are assigned to Delinquency Contribution Rate. This is assigned if they fail to file all required registration documents, file all quarterly UC tax returns and pay all contributions, interest or penalties that are due in the second quarter of the year for which the rates are calculated. This rate is assigned to delinquent employers as solvency measures applicable to that particular year. Hence, this delinquency rate is the sum of the Basic Rate (Reserve Ratio Factor + Benefit Ratio Factor + State Adjustment Factor) + 3 percent (3%) + the Solvency Measures (Surcharge Adjustment + Additional Contributions + Interest Factor). If there is an appeal against the UC Tax rate, then your employer can do so by accessing www.uctax.pa.gov or filing a written appeal with 90 days since the mailing date of the rate notice. The most important thing to do when you lose your job is to claim unemployment. You should ensure that you file your unemployment from the state that you have worked in. To check your claims, payment history, and benefit status, you can review the section above or call 888-255-4728 for more details. Just remember that once you file your initial application for UC benefits, you will receive three separate mailings within 10 days time. The first item would be, An official Notice of Financial Determination and you should review if the information of your finances is accurate. The second is a Claim Confirmation Letter which contains your Personal Identification Number (PIN) that will use to access your documents. Only you will access to this and the UC Service Centre cannot help you if you misplace you confidential PIN. This PIN will not change from year to year and can be used for your PAT. This Claim Confirmation Letter will also instruct you when to file your Biweekly Claims. Finally, you will receive the Unemployment Compensation Handbook that would provide information regarding compensation and your rights and responsibilities. In order to ensure claims are paid in total or partially, you should ensure that you must file biweekly claims for benefits. The first eligible week is the waiting week. You must file a claim and get credit for a valid waiting week. This period is required before you receive any benefit payment. You can claim eligibility by filing your biweekly claims online on Sunday from 6 am to 11 pm and on Monday through Friday from 6 am to 9 pm. at www.uc.pa.gov. Additionally, you can call the Pennsylvania Teleclaims – PAT system on Sunday from 6 am to 11 pm., and Monday through Friday from 6 am to 9 pm. These PAT numbers will be available from your UC handbook. Your UC claimants can be received as a Direct Deposit or through your Debit Card. You can opt for a debit card that will be mailed to your residential address after determining your financial eligibility. You can avoid fees using your debit card by accessing your information on the usbankreliacard.com website. Also, you can save on fees by withdrawing at branches that accept Visa cards and request for cash back purchases. Once you have your direct deposit, you can receive UC payments using your debit card. Unless you have submitted the form to stop direct deposit, your debit card will not be processed. Similarly, if you have your debit card number and PIN on your person, then you should speak to a customer service representative to make your debit card active. Similarly, you do not have your card number and PIN, then you should enter your SSN and ensure that the Chase customer service representative completes your request. Your debit card will help you cover your expenses during your transition period and transactions can be made at any place of your convenience. It’s a great way to shop, withdraw money when needed to simply cover your tracks when needed instantly. A word of caution is to ensure that you use your debit card sparingly as you might get carried away! Initially, it may take up to four weeks until you receive your payments that are issued via direct deposit. From the moment you become financially eligible for benefits, you will be mailed a UC debit card at the address you provided in your initial application to access all the benefits that you are entitled to. In case these benefits haven’t reached you, dial the toll-free number at 877-869-1956. Generally, payments are transferred on the date of the payment issue or the following day. However, payments are not transmitted on the weekends and on state, federal or banking holidays. Usually, benefits are paid biweekly and carried out within four days after the biweekly claim has been filed and considered. This may take up to 10 days to receive before payment is disbursed.But payments may be delayed if there is an eligibility issue that requires to be resolved or if the documents shared to UC are not complete and are returned. Payments may also be delayed due to natural calamities that cause time bound irregularities in discharging service. Enter your social security number and your PIN. Then, you are directed to a page that contains all your payment benefit information. Select the payment history option and you are directed to your current claim summary. When you select the View Benefit Payment History icon, you can review your history and check the payment status based on the date, payment number, status, amount paid, method of payment and the payment issue date. Hope we helped you understand what it takes to get your UC payments. You can play a role in assisting the community and connect hundreds of unemployed individuals that need help. Additionally, you can gain knowledge from our forum. You can also review, our earlier post on Pennsylvania Overcome anything that comes in your way and be the change. Receiving monetary compensation in the US for unemployment is guided by laws and framework prescribed by the U.S Department of Labor and operated independently by each state. The Unemployment Payments network is perhaps a perfect example of an all-inclusive social security system in a federal set-up. In case, you prefer to apply for benefits from your new state then you have every right to. But, the unemployment laws of the former state would still govern how your benefit payment calculations are determined. What is Unemployment Insurance in the U.S? A weekly compensation paid out to claimants who’ve lost their jobs due to involuntary reasons such as layoffs. Since this system is largely controlled by the state, one can receive up to 26 weeks of regular unemployment compensation determined on the basis of income earned during the base or alternative base period and other applicable criteria. Some states may also provide additional weeks of benefits, although the Emergency Unemployment Compensation(E.U.C) is now redundant. In exchange for the dole, the claimant has to fulfill some conditions such as making the required job searches during a given week and accepting a suitable job offer that comes their way. One of the most common concerns of claimants who wish to move to another state and seek job opportunities there relates to the transfer of benefits from the present state to the state where the person is moving to. 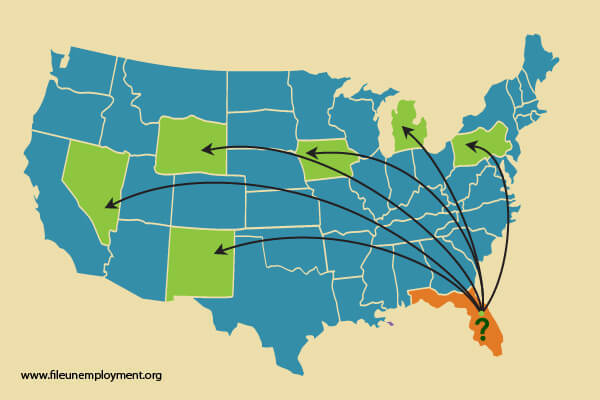 Can I Transfer Unemployment Benefits From One State to Another? Yes, you can. Although your previous employer would have remitted unemployment taxes to the state where your employment was based, you can get them transferred to the new state you’re moving to. All states are members of Interstate Reciprocal Benefit Payment Plan, which provides the required network for hassle-free transfer of your claim file to the new state. You must bear in mind the fact that once transferred, the laws governing the compensation system in the new state will apply to your weekly claims which can affect the claim amount and other determinants. Once the file has been transferred, you will need to start making the required job searches as per the new state rules and claim weekly to the extent of availability. Since this is an intrastate activity, you may have to wait for a stipulated time before starting to make claims again. How to Transfer UI Benefits? Firstly, it is very important to contact the Unemployment Office in your current state and let them know about your intention of moving to another state. Ask for specific paperwork that you may have to fulfill with the present state of claims. Once you’ve made an official communication and have moved to the next state, call the Unemployment Office and inform them about your movement and that you will be claiming the compensation and initiate a transfer. Post confirmation from your new state, start filing weekly claims just the way you did before. You will be required to provide all relevant paperwork such as SS and Address Proof in the new state. Ensure the availability of all the required paperwork. Moving the benefits from one state to another is an option that is available in the system. Before initiating one, consider the feasibility in terms of the various challenges surrounding it such as before making a decision. It may involve intensive paperwork since your file is moved from one state to another. You will be required to deal with both the states until completion of the transfer. The wait time can be testing, during which you may not be able to stake a claim in any of the states. Once the transfer is complete, the claims you make will be subject to the rules and conditions of the new state. Monetary benefits may or may not be of the same value you were receiving earlier in the previous state. Since it’s all virtual (online), you may still consider the option of continuing your claims from the base state even if you move to a different one until completion. As a responsible claimant, it’s your duty to inform the base state about your movement to ensure there are no hassles in the near future. Partial unemployment insurance programs are meant for full time employees who fail to work the stipulated full-time due to lack of work. Such claims are filed by the employers for employees who do not work full-time during the pay period owing to lack of work or by the employees themselves. This is usually done when employers want to retain employees even though there isn’t sufficient work. You still have to be on the payroll of a company in order to receive benefits. The eligibility is often determined by the state law, hence you may notice variations according to the state where you file your claims. In general, the following are the criteria that you must satisfy in order to qualify for the program. You must be able to work and you should be available for work. The time you worked or are working in a week must be less than what is by law decided as full time. i.e., If x number of hours per week is considered as the full-time work duration, you should have worked less than x hours in order to qualify. The only reason that makes you work less than the standard full-time duration should be lack of work and nothing else. You should be working for the employer and your weekly earnings should be less than the weekly benefit amount. You must establish monetary eligibility. The application procedure is not very different from the procedure for total unemployment. Claims can be filed through the Internet or via telephone. If you have to do it via the Internet, you will need to obtain a password by submitting an Employer Internet Password Application. Filing via Internet is by far the fastest method. 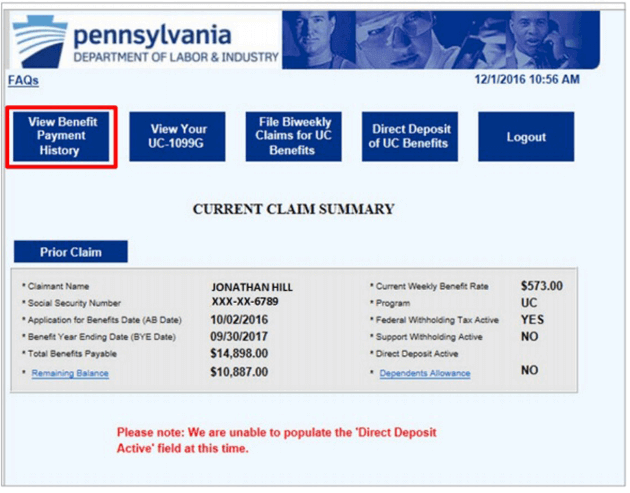 If you are looking for more details, visit Partial Claims section of DOL site. As of October 2012, if you weekly earnings are $500 or above, you will not be eligible for the program, no matter what your weekly benefit rate is. Okay, so this is how you calculate the benefits you may receive. You have to report the sum total of wages earned during a week, this includes tips or any other source of income. These wages you report will then be reduced from your partial benefit rate which is around 20% higher than your weekly benefit rate. In any case, the benefit you receive will never be higher than the weekly benefit rate. Consider this example. Assume you earn $100 a week. Your partial benefit rate as mentioned is 20% higher so that becomes $120. If you earned $50 during a week, you will receive $120- $50 = $70. Hence, $70 will be the amount of benefit you receive. Your partial unemployment benefits are either received via direct deposit or debit.You can check with your state unemployment insurance office for further information. You will receive benefits until you receive full weekly benefits or until the benefits year end. Financial constraints can be difficult for every human being. Try to stay calm and positive. Actively search for new and better opportunities and always remember, a healthy attitude can solve most problems! You have lost that precious job that provided all the financial support. Now what? Obviously, this is not the time to panic or being depressed. Take a step back, and relax – there is always another job waiting to be hunted for. You can use job search links on this site to look for new job, but the first thing you want to do is to file for unemployment insurance benefits and allow the lengthy process to start while you look for new jobs. This guide provides all the necessary steps to apply for unemployment benefits. Claiming Unemployment Benefits – Where to start? Estimate Benefits Amount using our unemployment calculator. Based on your eligibility, this smart tool provides an instant estimate of benefits depending on the data collected from you. Choose your filing method. Most state unemployment offices allow you to file your claims online or through a telephone. It is advised to file online or by visiting the state agency as telephone method is prone to data entry errors and you do not want to delay claims processing when you file the first time. You can always use the telephone method to extend unemployment benefits. Name of all previous employers in the last 2 years and their details. An approx. estimate of dates and duration of each employment. Generally, employers do not provide this info to states. After you have applied for unemployment benefits, wait for the benefits check and stay positive! It takes 2-3 weeks for state offices to process you claim and issue the check. Keep hunting for jobs in that period. Most importantly, do not sit idle. You can learn new skills, read new topics, or find a cost-effective volunteering opportunity to keep you mind engaged. Remember you are just searching for a job; there is no reason to let yourself down. Once you file for unemployment benefits, you should continue your job search. Then there is this brave new world of work from home jobs that you can do online. People are making a leaving and some are able to make a fortune out of such jobs that can work from the comfort of your home. Making money online is real and it takes virtually no investment. Tired of looking for jobs? Explore ways to make money online.